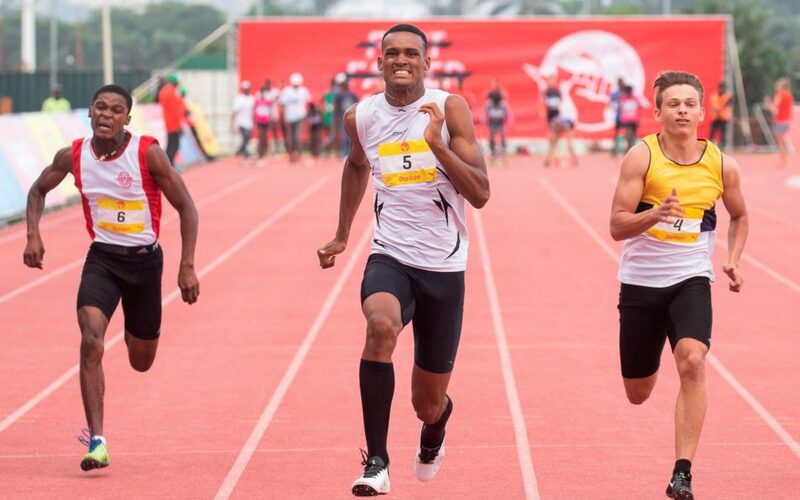 Seen here (in the centre): Mark Gaines (Morningside) was the speedster to beat in the PUMA School of Speed #3 Boy’s U19 100m. Gains crossed the finish line in a deserving time of 10.88 seconds. The Kings Park Athletics Stadium was buzzing with excitement on Saturday, 09 February 2019 when 720 junior track & field stars attempted to go #ForeverFaster at the PUMA School of Speed #3 following in the footsteps of the World’s Fastest Man Usain Bolt. Mark Gaines (Morningside) was the speedster to beat in the Boy’s U19 100m. Gains crossed the finish line in a deserving time of 10.88 seconds. “This is one of the best events in KZN. It’s prestigious and gives athletes the opportunity to compete on a high level. It’s a really good thing to do for the youth. This year I entered to focus on my training, I didn’t expect to do well. My focus is on my technique and on how to improve. Coming first in the final is a bonus. It’ll motivate me for the rest of the season. My advice to athletes is to work hard. If you want the achievement you have to work towards it. There is no other way.” Morne Hattingh came in 2nd, while Thomas Xolo finish 3rd. It was a clean sweep for Jessica Bompass (Pietermaritzburg) in the Girl’s U19 100m (finishing time of 12.43 seconds) and Girl’s U19 200m (finishing time 25.18 seconds). In the Girl’s U19 100m Snethemba Ngema came in 2nd, while Akhona Mathonsi finished 3rd. In the Girl’s U19 200m Snethemba Ngema came in 2nd, while Thembelihle Dubazane finished 3rd. Thomas Xolo (Umlazi, Durban) bolted to the finish in the Boys U19 200m in an impressive time of 22.38 seconds. “The PUMA School of Speed is a great place for opportunity to grow, a great place for talent to be recognized and also a great experience for runners. I got a bronze medal in 2016 in the 200m. Ever since that day I promised myself that I would get gold. Every day when I wake up and go for my morning jog I tell my coach that I’m going for that gold. Today I got it.” Morne Hattingh came in 2nd, while JD Prinsloo finished 3rd. JD Prinsloo took top honors in the Boys U19 400m in 49.23 seconds. Siphesihle Shongwe came in 2nd, while Lesedi Goge finished 3rd. Kirsten Ahrens crossed the finish line first in the Girls U19 400m in 56.28 seconds. Nicole Faulha came in 2nd, while Sithembiso Nkwanyana finished 3rd. Message from the Vice Principal: Junior track & field stars could meet South African middle-distance runner and 2019 PUMA School of Speed Vice Principal, Gena Löfstrand in the Vice Principal’s office at the stadium. PUMA ambassador and South African Paralympic shot-putter, Tyrone Pillay (Durban) also showed his support at the PUMA School of Speed #3 at the Kings Park Athletics Stadium. Pillay’s impressive list of accolades include South Africa record holder and African record holder, gold medalist at the All-Africa Games 2015 and bronze medalist at the Rio Paralympics 2016. LIVE Entertainment: During the break athletes and spectators enjoyed a live performance by KwaZulu–Natal born musician Holley Rey.